We’ve finally caught up our bulletin board! We had missed our chance to update the bulletin board for the Fourth of July. How long ago that seems, and could it really be the end of summer? At any rate, now that Namine is over whatever strange sickness took hold of her last week, she can begin second grade. That means, of course, a new bulletin board. Jessica and I discussed possibly doing a world map (well, as accurate as a flat one can get), or possibly some books or something else. My point is, we didn’t include Namine in the discussion. This, in retrospect, was a grievous error. It is, after all, her education and her school bulletin board, so she ought to have a say. Namine piped up and declared that she wanted to make a blue sky, a bright sun shining on green grass, and a red schoolhouse. Immediately, Jessica and I knew our mistake. If Namine had something specific in mind (she doesn’t always, in regard to our bulletin boards, but she did this time), of course we’d follow her direction. I laid out the sky and the grass, while Namine cut out the sun. By the time I was done, so was she. With the backdrop laid out, Namine asked me what a schoolhouse looked like. I found several different images on my phone, but she insisted they were all barns. No, really, we insisted, that’s what old-timey schoolhouses looked like. Jessica backed me up on this; only then did Namine believe me. Namine picked out a schoolhouse picture that she liked, and set to drawing it on red construction paper. A simple grassy knoll — never mind, it’s not even a knoll, it’s a plain — wouldn’t do. We had to make it better, and better way to improve it than to put our own faces on it? So we printed pictures of ourselves and cut out our faces. 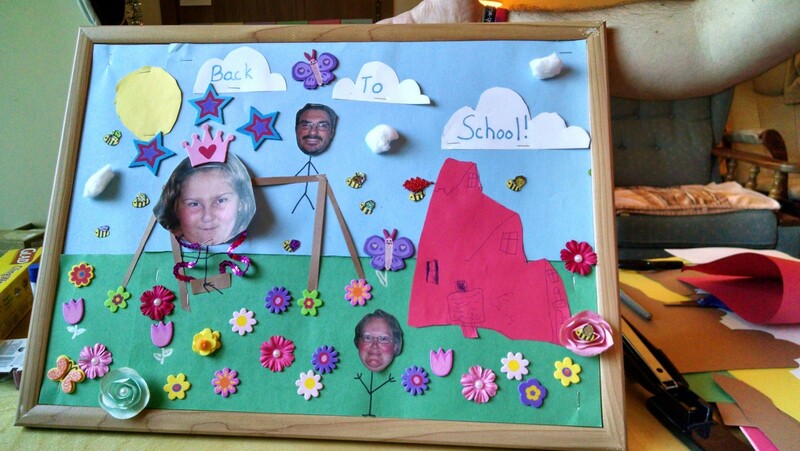 We put the finishing touches on our new board with flowers, butterflies, and of course bees. The weather in Wisconsin may not always be welcoming, but our board certainly reflects Namine’s outlook on school — nothing but sunshine. And bees.